Click HERE for tickets to the Surf & Turf Festival! San Clemente City Hall Flag Raising & Display to honor recently deceased US military veterans for their service & sacrifice on behalf of the American people and the freedoms we enjoy. 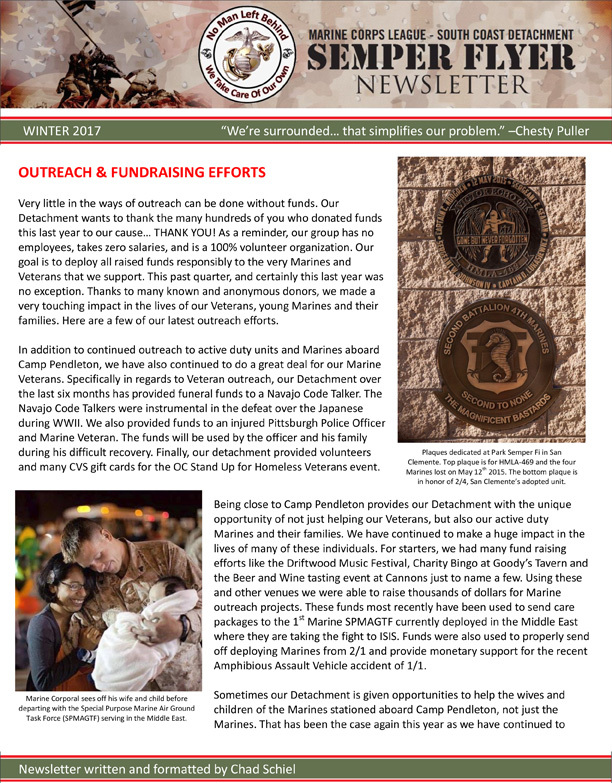 Your Marine Corps League-South Coast Detachment 022 which was Chartered on January 15, 1974 is an All-Volunteer, Non-Profit Organization and one of several Detachments located throughout the United States. Our Detachment and others is overseen by its Marine Corps League National Headquarters in Merrifield, Virginia. Membership is available to All Marines & Navy Corpsmen/Chaplains who served with Marines who are Active Duty, Reserve, Former or Retired, or honorably discharged Veterans, and may be either Officer or Enlisted. We have Associate Membership for Marine family members, other Veterans, and any and all Friends of Marines. Our Ranks continue to grow and all those willing and able are encouraged to Apply for Membership. Members of the Marine Corps League join together in camaraderie and fellowship for the purpose of preserving and promoting the interest of the United States Marine Corps, banding together those who are now serving in the United States Marine Corps and those who have been honorably discharged from that service that they may effectively promote the ideals of American freedom, and democracy, voluntarily aiding and rendering assistance to all Marines and former Marines and to their widows and orphans; and to perpetuate the history of the United States Marine Corps and by fitting acts to observe the anniversaries of historical occasions of particular interest to Marines. Filming, editing, and narrating for the two videos above by Chad Schiel.